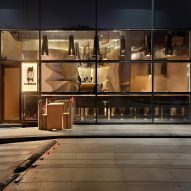 Indian architecture studio Nudes has built an entire cafe in Mumbai using cardboard to prove its versatility as an environmentally friendly material. Everything apart from Cardboard's core, shell and services in the cafe has been made from cardboard. Walls, chairs, tables and even lampshades have all been sculpted from pieces of the corrugated material. 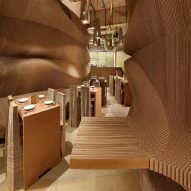 The curving and fluted shapes of the furnishings are formed by multiple layers of cardboard precision cut to produce the desired shape. Benches cut from the wall panels protrude out into the space, and pieces such as tables and children's highchairs are made from cardboard elements that slot together. Cardboard was chosen for its recyclable and biodegradable properties. 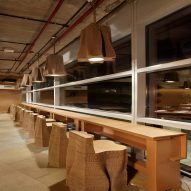 It is also an insulating material that absorbs sound well in the noisy cafe in environment. 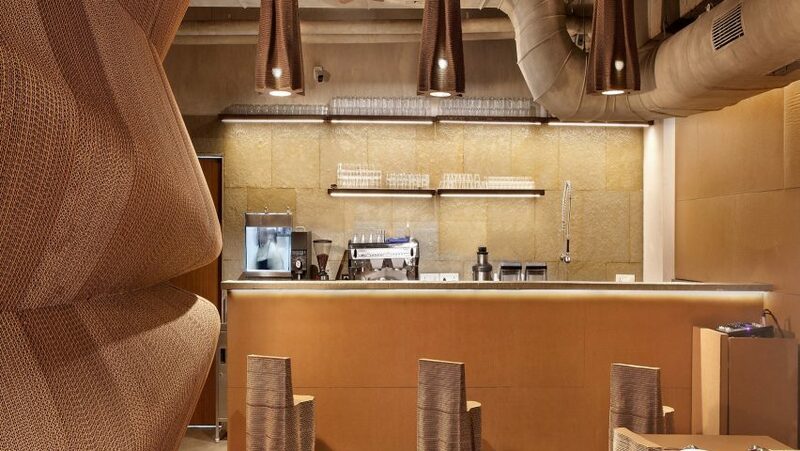 Nudes, an architecture studio founded in Mumbai by Nuru Karim, designed the cardboard cafe to show how versatile and hard-wearing a biodegradable material such as cardboard can be. "Building with cardboard meant constant exploration and inquiry into material performance," said Nudes. "The table tops are impregnated with wax treatment to prevent water absorption and facilitate ease of maintenance," the studio added. "We are hoping that this space evolves into a vibrant hub for dialogue and conversation on the role of design, material & technology in protecting the earth's resources towards a sustainable future." Architects from around the world are experimenting with cardboard. Californian firm Brooks + Scarpa lined the walls of Aesop's Los Angeles store with recycled cardboard tubes. In Amsterdam a design collective called Fission Factory has devised a modular housing system that uses interlocking pieces of cardboard to form a house frame that can assembled in under 24 hours. The architect best known for using cardboard as a building material is Shigeru Ban. The Japanese architect created a cathedral in Christchurch, New Zealand, from the material, as well as a cabin for hikers and a pavilion at the IE School of Architecture and Design in Madrid. Photography is by Mrigank Sharma.